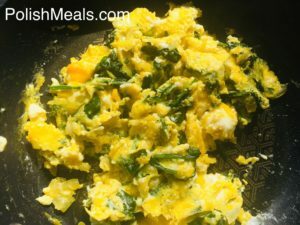 I eat eggs for breakfast every day but always in a different scenario. 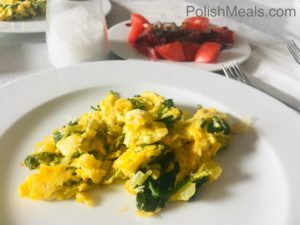 Today, it is a green version of scrambled eggs – loads of iron and full of taste breakfast idea. 1. 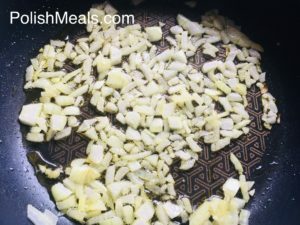 Add onion into room temperature oil and bring to fry, medium heat. Fry until soft for about 3 minutes. 2. 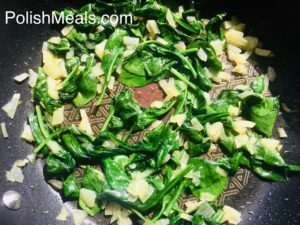 Add spinach and fry medium heat, until shrinks, about 3 minutes, stirring occasionally not to burn. 3. 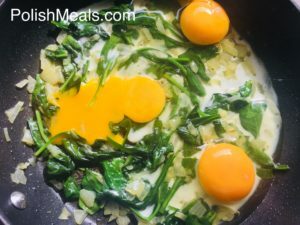 Beat 3 eggs onto the pan, add salt, stir with bamboo spoon and fry for another 3 minutes until eggs get your desired texture (you might like them soft or firm). Posted in: Breakfast, Main Courses. 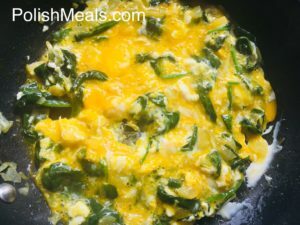 Tags: Breakfast, egg, eggs, healthy, onion, polish, recipe, spinach.